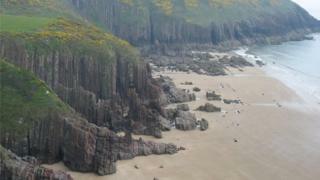 A man's body has been found on a Pembrokeshire beach. Dyfed-Powys Police were called to Manorbier beach, Tenby, at about 07:35 GMT on Saturday. Officers said the man had been identified and next of kin and the Coroner have been informed.